Running is the cheapest kind of physical activity. It does not take too much strength or time as well. However, how beneficial is it compared to walking? Walking is an easy activity as it fits anyone with any physical training. Moreover, it is a nice way to burn calories and lose weight. Walking makes almost all of your muscles work, meaning it can be beneficial for your whole body. Running is an enhanced walking. The most significant difference between running and walking is in how you move. When you walk, one of your feet is always on the ground, while running makes your whole body stay in the air for short periods of time. Therefore, it is harder to run; not only because you move faster, but also because you have to lift your weight with every step. Even a slow run is more exhausting than a fast walk. This means running makes metabolism rise higher. And with higher metabolism, you need more calories, losing weight faster. When you run, you breathe faster, because your body requires more oxygen. Oxygen is being delivered through blood, so your heartbeat rises too. This means your whole organism works faster when running. 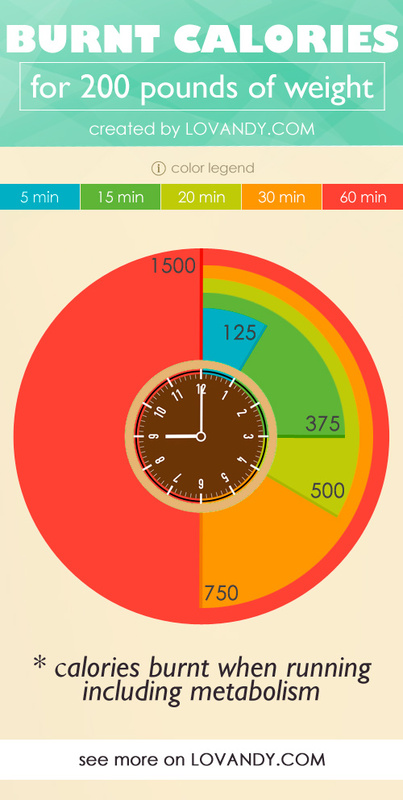 So, calories are burnt rapidly. Running is a nice way to keep your body fit and healthy. 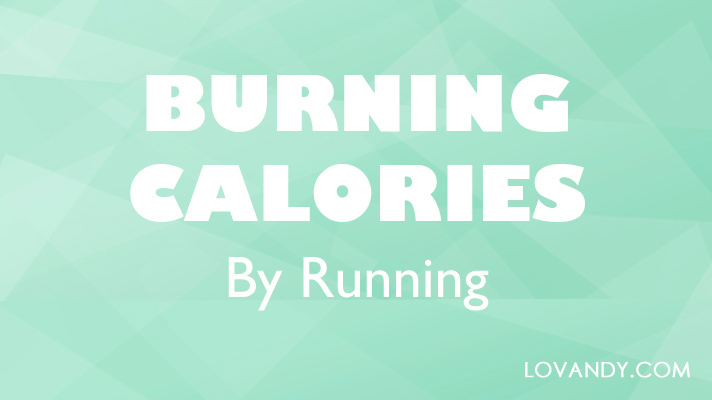 However, how do you know the amount of calories you have burnt? Actually, it is pretty simple. There are two variables that affect this amount: your body weight and distance. The same is true about walking. You can use the following formula every time you want to calculate your calories consumption when running. It takes regular metabolism into account, so it is accurate. where 0.75 – coefficient, BW – body weight, D – distance. However, if you want to know the exact number of calories burnt by running alone, use the next one, which excludes regular metabolism. Notice that there is no difference in how fast or for how long you run. It all depends on your weight and miles only. As we have mentioned, running is when you lift your whole body in the air. Therefore, there is almost no difference in speed. The more miles you have run, the more calories you have burnt. That is why running is so good for everyone. You do not need any hard training and preparations. Just run for as long as you can (in reasonable amounts). There are, however, some contraindications to this activity, for example, heart diseases. Ask your doctor before starting to run regularly. 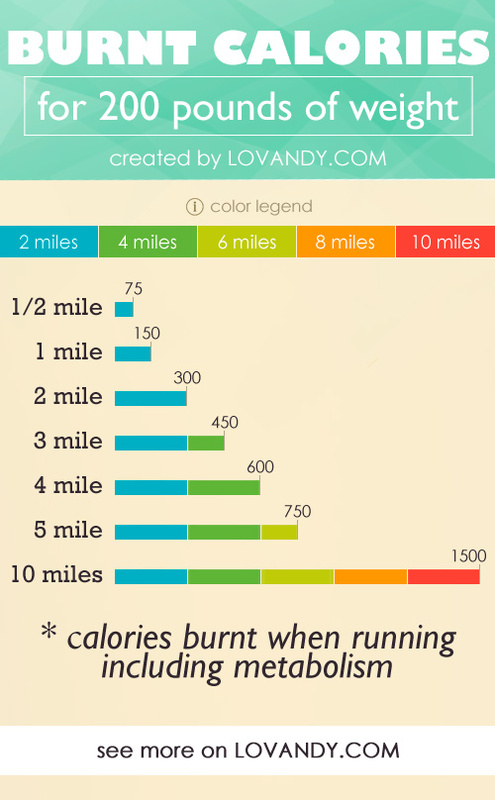 Weight and distance are the only indexes for calories burnt by running. Let us consider the most common examples of how to use the formula we have discovered (1 pound = 0.45 kilos). Notice that 15 mph speed is almost a fast run for an average person; 10 mph is an average running speed. So, running a marathon, you can burn more than your daily intake of calories. Of course, it is rather hard and nobody can make it just as is. Marathon requires a lot of training. You can run only 3-4 miles, and that will be enough. Especially if you combine it with some exercises. There are some enormous numbers in the table above. However, it is all calculated for one speed (15 mph). Of course, only sportsmen can run that fast for more than 1 hour in a row. So, consider these numbers only mathematical. You should combine running with rest. For example, go for 5 minutes run/5 minutes break. As you can see, with more weight you spend more calories per mile of running. However, it might be harder for you to run such distances. Start with something easy, like half of a mile a day. Running has all the benefits of walking, yet being even better for your fitness. It helps burn calories faster, however, is still pretty easy and cheap. You can combine running with some exercises to achieve the best result.